Microsoft has quietly discontinued its Genuine Advantage Validation for Office. 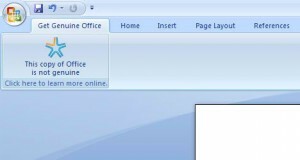 Earlier when users want to install new add-ons or templates they have to go through the online Genuine Advantage Validation to make sure that their copy of Office is genuine. It is not clear why Microsoft has dropped this but it is sure to make genuine user's life a lot less annoying. This affects only the installation of add-ons and templates to Office. Microsoft Office's authentication method which requires a password and direct activation from Microsoft's server however remains in place.